This long novel, reviewed by John Updike, in The New Yorker, leads us to question the topics of his earlier novels, “Chinese”novels, even if his work is written in English. Jin Xuefei was born in Manchuria in 1956; changes in postings of his father, an Army officer, will make him familiar with the northern provinces where he stayed after joining, very young, the People’s Liberation Army at the beginning of the Cultural Revolution. In 1977, he studied English at University and American literature. A scholarship from Brandeis University will bring him to the United States in 1985. His plans to return to his family in China were upset by the events of Tiananmen Square in 1989. He decided to settle in the U.S., manages to bring his wife and son, and with small casual jobs, began writing poetry and a book “Between Silences” found a publisher in 1990. The first books and the first literary prizes:Two other poetry collections will follow. Three short story books (unfortunately not translated in French) will be published which take place in the army and in the North of China; these books collected many awards. His first novel, “The Pond,” is quickly followed by “Waiting” which won the 1999 National Book Award and PEN / Faulkner Award. 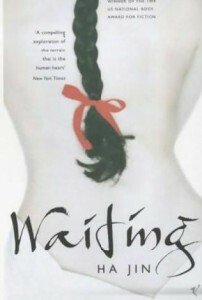 “Waiting” is about the life of a doctor, married by his family, who will have to wait eighteen years before he could live with the woman he has chosen. The style, neutral, distant, makes us feel the oppressive weight of the Communist Party and of the hierarchy of the hospital on the private life or rather the lack of private life of our hero. No mention of the drama of the Cultural Revolution but we can follow the difficulties of daily life and the political pressure day after day. The following book dares to mention the 1989 crackdown.“The Crazed”, in 2003, relates to a memory of Ha Jin. An old professor, after a stroke, is delirious but also speaks of painful and hidden episodes and wonders about the meaninglessness of his life as an intellectual. His student, engaged to his daughter, impressed by these confessions is reluctant to pass exams that will open to him the same kind of life. He will eventually join the students of the Beijing Spring; madness of the teacher… madness of the regime … These two books and ” In the Pond” are translated in France by Le Seuil early 2004. “War Trash” is translated early 2006 (ed. Le Seuil). To my opinion, this is a great book and Ha Jin obtained for the second time a PEN / Faulkner Award. A retired Chinese professor is writing his memoirs as a prisoner of war in Korea. Ha Jin has not been involved in the Korean War, it is a fiction but the narrator is partly the spokesman of the author. In a camp, he is under pressure by the Americans, who, for political reasons, want the Chinese prisoners to join the Nationalist regime in Taiwan. The Communist Party controls the camp but the prisoners know very well that back in China will be shameful, a released prisoner alive can only be a traitor. This universal book against war and the army, written in a documentary style, reminds us of recent episodes like Abu Ghraib and Guantanamo Bay. The question is interesting and complex; references of Ha Jin are no doubt Chinese. This is obvious in all his books except perhaps the last one. But he has never written in Chinese. He addresses himself the problem of language in many texts. Sometimes he gets rid of the problem by explaining that if he wrote in Chinese, he would be censored in China but he also discusses the difficulties of his learning and his sense of being somewhat crippled or impressed to be a follower of Conrad or Nabokov, who also have not written in their mother tongue. ► Ha Jin, “A Free Life”, Pantheon Books, October 2007, 672 pages.